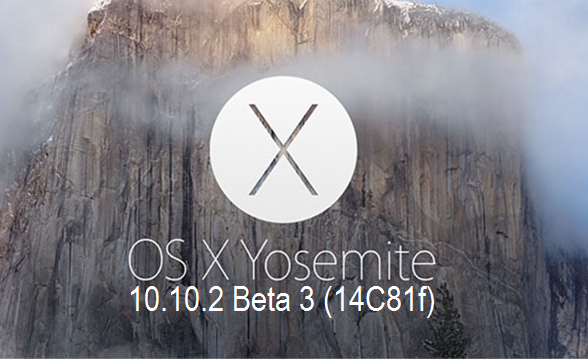 Mac OS X Yosemite 10.10.2 Beta 3 (Build: 14C81f) has been seeded by Apple, which is the third beta version of OS X Yosemite 10.10.2 along with Xcode 6.2 Beta 3 (Build: 6C101). Mac OS X developers and non-developers (general users) can install / update / upgrade to the latest available released for testing and experimenting of various functions, applications and features. The Direct Download Links of OS X Yosemite 10.10.2 Beta 3 Combo / Delta Update .DMG File are posted below. Apple has also released the final version of Safari 8.0.2, Safari 7.1.2 and Safari 6.2.2 along with the beta version of Safari 8.0.3 Beta, Safari 7.1.3 Beta and Safari 6.2.3 Beta web browsers for OS X Yosemite (10.10+), OS X Mavericks (10.9+) and OS X Mountain Lion (10.8+) Mac operating systems. Xcode 6.2 Beta 2 (Build: 6C95a) was the last Xcode developer toolset released by Apple. The official changelog of OS X 10.10.2 Beta 3 (14C81f) includes; Wi-Fi connectivity, Mail and Voice-Over improvements and bug fixes. Xcode 6.2 Beta 3 (6C101) release notes holds; Developer toolset for Mac, iPhone, iPad, and Apple Watch, that requires OS X Yosemite or OS X Mavericks with the inclusion of iOS 8.2 Beta 3 SDK and OS X v10.10 SDK. How to Install OS X 10.10.2 Beta 3 Manually? Mac OS X users can update old software version to latest OS X Yosemite 10.10.2 Beta 3 (14C81f) via Mac App Store >> Software Update function. Mac OS X developers can go to OS X Dev Center website to get OS X 10.10.2 Beta 3 Downloads officially. Mac OS X non-developers (general public) can install and activate OS X 10.10.2 Beta 3 via iTunes for FREE without Apple UDID and OS X developer account. Download OS X 10.10.2 Beta 3 Delta / Combo Update .DMG Files via Direct Links.